Directions: Mix all dry ingredients together in a small bowl. In a medium sauce pan, medium heat, combine tomato sauce, water and spice mix and stir well until combined. Heat until the sauce is warmed through and as thick as you like it. Preheat the oven to 425. Chop the onion and the garlic and cook in the oil in a pan over low/medium heat for about ten minutes, or until the onion has started to caramelize. Make sure you don’t burn the garlic! Once this is done, take mixture off the stove and set aside. Rinse the chicken and then poach in a large pot of simmering water until done. This will take about ten minutes or so; be sure to cut through a piece to check if it’s cooked through! Drain the cooked chicken and set aside to cool. Once the chicken has cooled, use your fingers to shred it. Mix the chicken with one and a half cups of the enchilada sauce, can of green chilies, one cup of cheese, a pinch of cayenne and the onion and garlic mixture. Stir well to combine. Pour half a can of enchilada sauce in a large glass casserole dish. 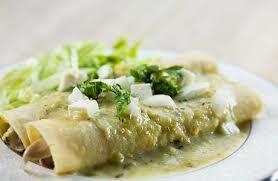 Fill each flour tortilla with about one fourth cup of the chicken mixture. Roll up and place seam-side down in the dish and repeat with the remaining tortillas. Once you have filled up the dish completely, pour another cup of enchilada sauce on top and sprinkle with the remaining cup of cheese. Cover loosely with tin foil and bake for 10 minutes. Remove foil and bake for another ten. Cool and serve with hot sauce, avocado slices and salsa.